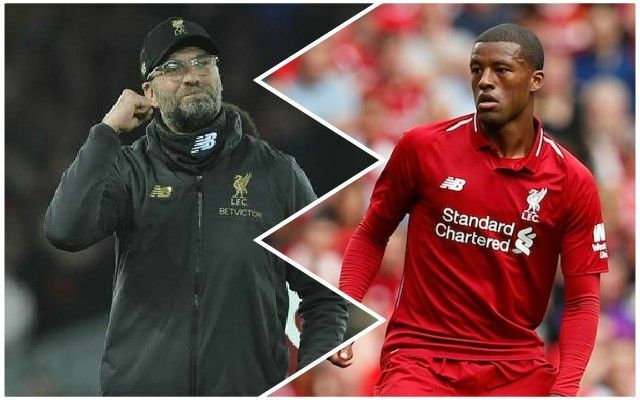 How good has Gini Wijnaldum been this season? The Dutchman has truly been a sublime influence in the middle of our park and is enjoying his best campaign in red to date. The manner in which he finds the right positions to wait in and then transition us from defence to attack is impressive; but his continental ability to keep the ball in tight situations is his best asset. Wijnaldum was one of the less heralded players following last night’s 5-0 victory over Watford, but mainly because his team-mates put in world-class outings. Fabinho in the holding role and Trent Alexander-Arnold were jaw-dropping – and that’s before mentioning the two boys who bagged a brace – Sadio Mane and Virgil van Dijk. Wijnaldum though thinks the negativity after picking up a point away from home against the country’s in-form side was a little out of order. In fairness, he’s probably right. “I think the reaction was only because of the season United had, which was not that great,” he told the Evening Standard. “If you collect a point away from home at Manchester United, then normally it’s a good result. “But the situation they have had, the way the game goes, everybody already thought that Liverpool had to win, especially with the substitutions in the first half. A win would though be very nice away at Everton this Sunday. With ten games remaining, every fixture is like a Cup Final, considering Manchester City are just one point behind us in the title race. They take on out of sorts Bournemouth, who they’re guaranteed to beat – so three points is a big but important ask from Jurgen’s Reds a day later.